Designed to take full advantage of its unusually wide and deep lot, this meticulously built home by the Kohlmyer/Sangiacomo team has great scale and style. Elegant & contemporary design touches with great use of color and high quality materials throughout define each space. The main living level boasts an open kitchen/great room with a large deck & access to the landscaped yard – all ideal for entertaining – as well as a formal dining room and a library/office with a fireplace. You will also find a pantry and a spacious powder room. The upstairs bedroom level hosts a luxurious master suite with a large walk-in closet, soaking tub a private view deck plus two additional bedrooms and baths. The laundry room on this floor makes the chore a breeze. The lower level family room and fourth bedroom share a full bath and overlook and connect to the gorgeous yard. Temperature-controlled wine room, gracious foyer with a coat closet and a 2-car side-by-side garage complete this level. The roof-top terrace has panoramic views of downtown, Bay Bridge and the hills of Noe Valley. It is outfitted with a wet bar that includes refrigeration, a cor-ten steel gas fire pit, cedar siding, outdoor speakers and cable TV wiring. This home is sophisticated, accessible and warm. 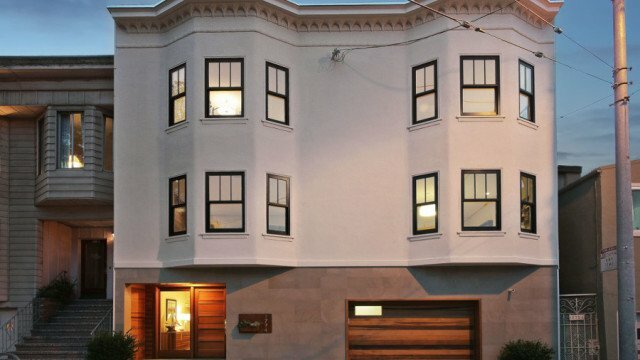 It is in a coveted Noe location with easy access to downtown and highways, near corporate shuttle bus stops, surrounded by great restaurants and services and best of all – great weather.